It’s hard to fight back against anxiety, worry and depression … and it’s even harder to face and overcome those fears by yourself. 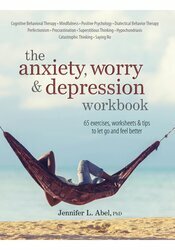 That’s why anxiety expert Jennifer Abel, PhD, has compiled an interactive workbook that will help you tame anxiety, worry and depression. Backed with science and over 25 years of clinical experience, this easy-to-use guide is full of practical, proven worksheets, self-monitoring forms, exercises and scripts for you to start changing your habits, and start changing your life. <> international speaker, author and clinical psychologist, has specialized in the treatment of anxiety disorders for over 30 years. She is the author of the bestselling card deck, Melt Worry & Relax Card Deck: 56 CBT & Mindfulness Strategies to Release Anxiety. "In this comprehensive yet easy-to-use format, Dr. Abel walks readers through a treasure-trove of tips and strategies likely to start helping right away. Dr. Abel's expertise in the research behind each of these exercises allows her to explain them in a way to readers can both understand and trust. I was very impressed by her ability to bring together insights from both mindfulness and cognitive-behavioral traditions in such a seamless and understandable way. Her inclusion of tips for therapists as well is a plus not found in most self-help books. This book is an excellent resource for anyone looking for ways to reverse old mental habits of worry that are leading to unnecessary anxiety and/or depression."